Welcome to Collection Agency information. Our goal is to provide free and accurate information on collection agencies, debt collection laws and best practices for in-house collections. We are committed to finding the freshest and relevant recovery collection agency information for you from multiple sources including industry publications and expert authors. We have high standards and we want you to recover your money as quickly as possible. We know that the decision to use a collections agency isn’t one to be taken lightly. What will happen to your reputation? What will your customers or patients think of you? How will the collection agency treat your customers? You should know that professional collection agencies do exist that can help you recover your money and keep your customers. The real challenge is to create the most efficient in-house collections process and find the ‘sweet spot’, or best time to turn over the non-paying accounts to a collection agency. Then you have to research, find, interview and select a collections firm. Do you need a retail, medical or a commercial collection agency? You must also be aware of Fair Debt Collection Practices Act and other debt collections laws as well. 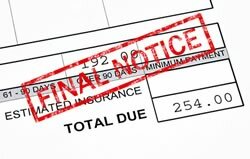 The firm you chose should as have debt collection agency insurance. We hope you enjoy all the free collection agency information provided.